Yamaha’s YFZ450R high-performance ATV enters the 2016 season carrying pro number one plates from both the Grand National Motocross, and Cross Country Race Series with factory racers Chad Wiener and Walker Fowler. Yamaha’s YFZ450R high-performance ATV enters the 2016 season carrying pro number one plates from both the Grand National Motocross, and Cross Country Race Series with factory racers Chad Wienen and Walker Fowler. 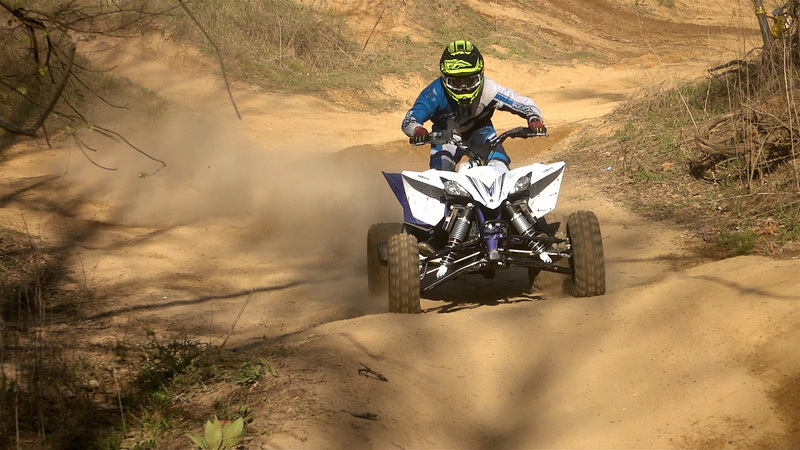 The YFZ450R was designed to work on the trail with performance focused for the track, so it’s no wonder the machine has risen to the top of both disciplines of racing. 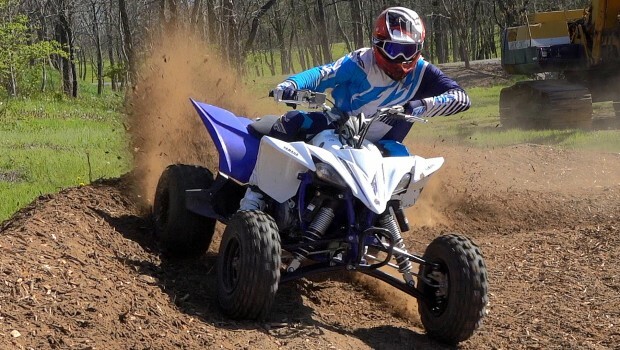 Not only is the YFZ450R the only true second generation 450cc class machine; with several rounds of updates since its release in 2009, the YFZ450R is arguably the most refined and updated sport ATV since Yamaha’s first generation YFZ450. In its most recent round of updates in 2014, the engine received a higher compression piston and new cam profile in search of improved low-end snap. The crank received a .25mm longer connecting rod and big end bearing for improved durability. A new exhaust was added to improve mid to top-end power with a new ECU, throttle valve, and fuel map updating the electronics and fuel system. 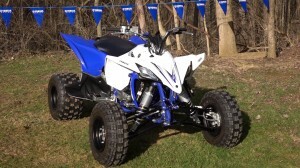 In 2014, the YFZR also became the first and only ATV with a factory installed assist and slipper clutch. New, lighter shocks feature revised settings at both, to better smooth out the smaller bumps without sacrificing bottoming resistance. New Maxxis tires improved handling. Rounding out the updates, the ergonomics were opened up by moving the front fenders forward, and the rear fenders back and down. The upper front frame rails were covered for greater comfort, and quick release fasteners became standard equipment on both the standard and special edition model to speed maintenance. 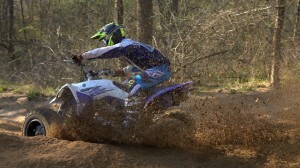 Since its launch in 2009, we’ve done several track tests of the YFZ450R. Walker Fowler’s success in cross-country racing is a reminder that the YFZR was developed for trail as well as the motocross track. We know that a majority of the YFZ450Rs sold will never be raced, and there’s a good chance they’ll be ridden on both tracks and trails. With this in mind, we rounded up a 2016 Yamaha YFZ450R for our first combination track and trail test of the machine since 2009 to see how the recently updated machine performs against everything we have to throw at it. 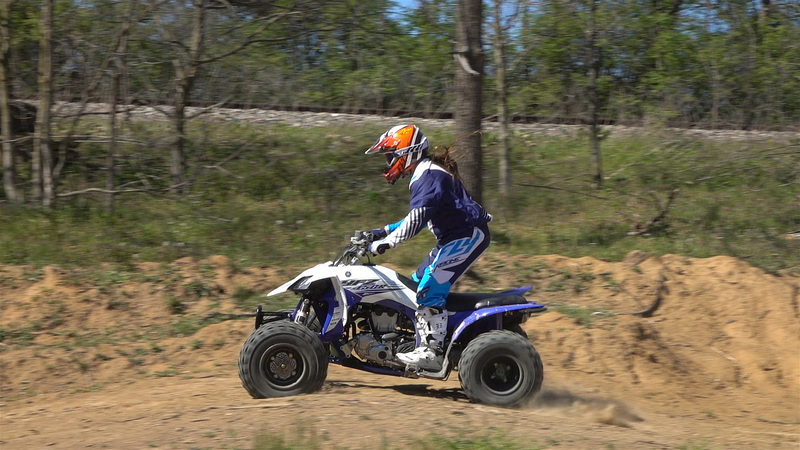 To put our YFZ450R to the test, we headed to Haspin Acres in Laurel, Indiana to hit the trails, and then to a private motocross track in Northern Kentucky. 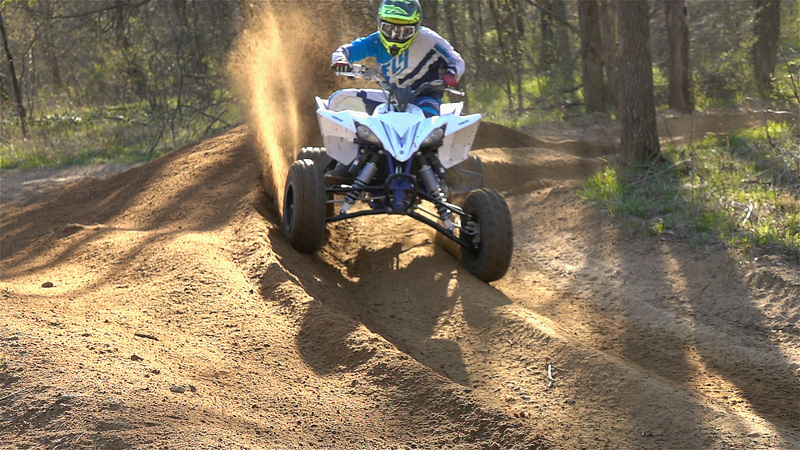 Our test riders include 44-year-old, 5’8”, 19-lb Rob Ray, a highly experienced play rider accustomed to pushing stock sport ATVs to the limit and 18-year-old, 155-pound Jordan Trimble. Both are highly skilled riders, offering different backgrounds and perspective. The YFZ450R is powered by a 449cc, liquid-cooled, four-stroke engine with a large-bore and short-stroke of 95.0mm x 63.4mm. An 11.8:1 compression ratio is comparably high, but still allows for the use of premium pump gas. The YFZ450R is powered by a 449cc, liquid-cooled, four-stroke engine with a large-bore and short-stroke of 95.0mm x 63.4mm. An 11.8:1 compression ratio is comparably high, but still allows for the use of premium pump gas. Its DOHC head uses five-valves, (three intake and two exhaust), with light-weight titanium valves to reduce reciprocating mass for faster revving. Electric start brings the engine to life. It fires right up and warms up quickly. 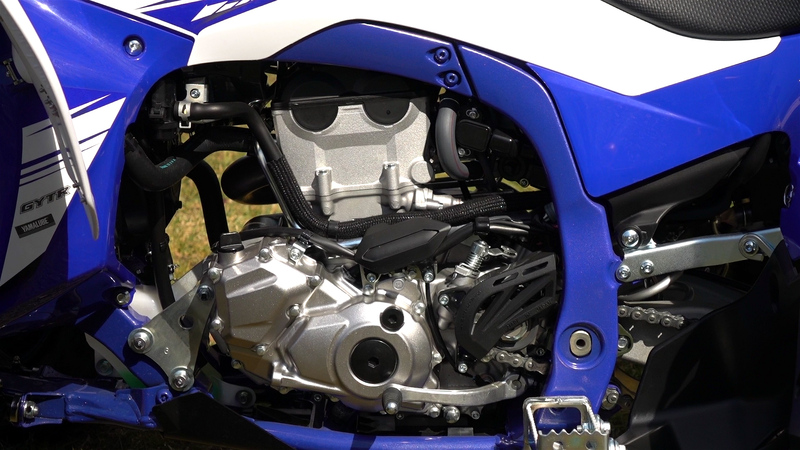 A Yamaha Fuel Injection system delivers air and fuel via a 42mm throttle body. 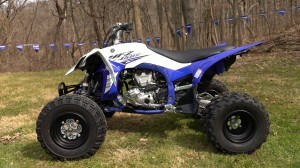 Yamaha developed the YFZ450R’s gnarly five-speed manual transmission to withstand stress of high-horsepower modifications. Its unique assist and slipper clutch uses a ramped design and three-spring setup. The ramped design increases clutch plate pressure under acceleration while allowing the clutch to disengage and slip a bit during compression braking. The said benefits are better suspension performance in braking bumps and lighter clutch pull. Bone stock, the YFZ450R runs impressively well, although you can tell that lets some horsepower potential on the table to meet emission standards. While the power delivery is rather smooth for a 450, it pulls best from the lower-midrange up. At lower RPMs, the engine runs decently without as much of the jittery feeling stock Hondas and older carbureted YFZs emitted. Its low-end smoothness helps on the trail. Being a 450, though, you can’t easily lug your way up steep hills or over large obstacles like an old school four-stroke. At lower RPMs, the engine runs decently without as much of the jittery feeling stock Hondas and older carbureted YFZs emitted. The YFZR’s engine is, for the most part, a corked-up race motor so it likes to turn RPMs. The motor starts pulling hard in the lower midrange, feeling unstoppable as you rev it well into the top end. Power starts tapering off a bit before the rev limiter kicks in, so it’s best for lap times and reliability to upshift before you start bouncing off the rev limiter. The YFZR’s engine is, for the most part, a corked-up race motor so it likes to turn RPMs. The motor starts pulling hard in the lower midrange, feeling unstoppable as you rev it well into the top end. Working in the top half of the power, the YFZZR rips out of turns allowing you to choose between powering through, or holding a drift, with plenty of snap to rip the rear-end loose and pitch it sideways on command. 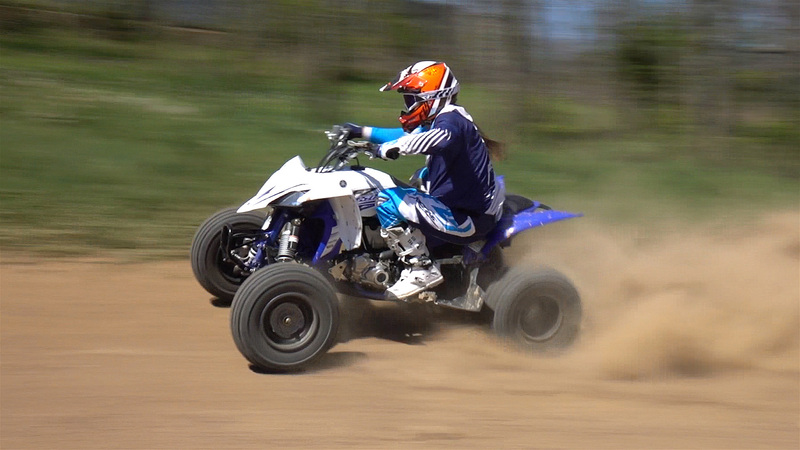 Even stock, the YFZ450R’s fast-revving engine produces enough horsepower to clear most jumps at almost any given track. Attacking hills on the track, or the trail, are no problem; just keep the engine in the midrange and up, and hold on. Thanks to the manufacturers being forced to run their engine’s super lean right off idle to meet emission standards, the YFZ’s engine has a slight hesitation off idle, which you don’t notice when riding. It flared out a couple times when hitting the gas right off idle under 5mph when there was no forward momentum to keep the engine churning. It kind of reminded us of riding carbureted 450 before fuel injection made them nearly stall proof. 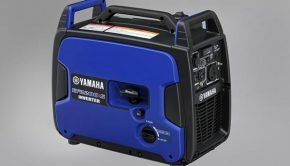 Adding an aftermarket fuel management system like the Power Commander V, available through Yamaha’s GYTR accessory catalog, for closed course competition use only, of course, will take care of the lean bottom end and should yield more horsepower, even with a stock exhaust. The transmission’s gear rations are near perfection. 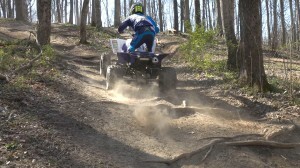 First gear is low enough for tighter, slower trail sections without the need to abuse the clutch. There were no annoying gaps between gears making it easy to keep the engine in the meat of its broad power band. Clutch pull is extremely light thanks to the A&S clutch. Its slipping effect is light, while it may help reduce the effect of roots and braking bumps on the drivetrain and suspension under deceleration a bit, it definitely doesn’t eliminate the 450s mild-mannered compression braking, which we feel is a good thing. A unique hybrid aluminum and steel frame uses cast-aluminum throughout, attached to steel lower frame rails providing added durability while allowing the engine to be mounted lower in the chassis. A unique hybrid aluminum and steel frame uses cast-aluminum throughout, attached to steel lower frame rails providing added durability while allowing the engine to be mounted lower in the chassis. Yamaha uses a lightweight, removable aluminum subframe, aluminum upper A-Arms, and a light, yet strong, cast-aluminum swingarm. The KYB shocks are some of the nicest stock shocks to ever adorn a mass-produced ATV. The massive shocks feature preload, high and low-speed compression, and rebound damping adjustment. The KYB shocks are some of the nicest stock shocks to ever adorn a mass-produced ATV. The massive shocks feature preload, high and low-speed compression, and rebound damping adjustment. They are the only production ATV shocks on the market featuring Kashima coating, reducing friction and component wear. Suspension travel is ample for recreational riding and most levels of racing with 9.8” front and 11.0” out back. The YFZ450R is low and wide measuring in at a track friendly width once considered too wide for trail riding at 48.8” wide, with a 50.0” wheelbase, and a low seat height of 31.9”. 21×7-10 front and 20×10-9 rear Maxxis tires developed for the YFZR are mounted on lightweight aluminum wheels. The YFZ450R is low and wide measuring in at a track friendly width once considered too wide for trail riding at 48.8” wide, with a 50.0” wheelbase, and a low seat height of 31.9”. Built to withstand abuse, the YFZR is a bit heavier than some of its 450cc predecessors at 405 pounds, although the weight is well disguised thanks to the machine’s low center of gravity. Right out of the box, the shocks eat jump landings, hammer straight through rollers, and resist body roll like motocross racing suspension should. Whether we came up a little short or overshot the jump, the KYB shocks never bottomed hard, or bounced and deflected. They always seemed to do an admirable job of sticking our rider’s sometimes imperfect landings. Hammering through deep whoops, the shocks did a good job of absorbing impacts and recovering quickly, keeping the machine tracing straight. Right out of the box, the shocks eat jump landings, hammer straight through rollers, and resist body roll like motocross racing suspension should. The shocks seem to be set up ideally for a 180-200 pound rider. Rob could easily race MX locally with these shocks and soften them up enough to hit the trail in decent comfort and control. The shocks are perhaps a bit too firm for riders under 160 pounds on rough wooded trails. On rooted or rocky trail sections, and even small chop on the track, the shocks feel a little harsh in stock trim. We backed out on the shocks low and high-speed compression and rebound damping greatly improving small bump compliance and allowing us to better hold a line. 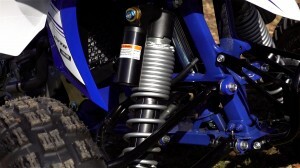 The shocks seem to be set up ideally for a 180-200 pound rider. Rob could easily race MX locally with these shocks and soften them up enough to hit the trail in decent comfort and control. The shocks are perhaps a bit too firm for riders under 160 pounds on rough, wooded trails and cross-country racers will most likely want slightly softer springs and internal valving. Their massive size and excellent component quality make these shocks ideal for an aftermarket tuner to work with yielding aftermarket shock performance at a fraction of the price of new shocks. It’s impossible to build shocks that will serve every rider’s weight and use, but as stock suspension goes, the YFZ450R’s suspension is the best we’ve experienced in the 450cc class to date. 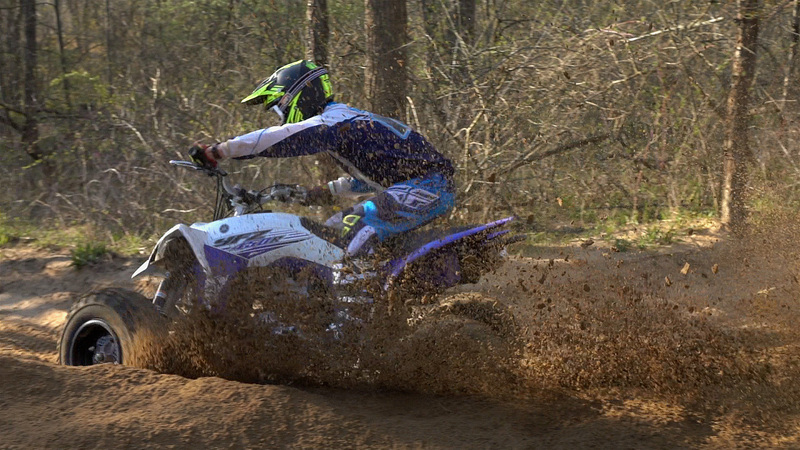 With a maximum race legal width of 50” for motocross, the 48.8” wide YFZ is wide enough to win races on the track. The 20” low-profile Maxxis tires work well on sandy, rutted tracks, or heavy, loamy tracks where taller tires help. With a simple switch to 18” rear tires, the YFZ is ready to go on most typical MX tracks where a low center of gravity is more important than ground clearance. 20” rear tires are the minimum standard size for a trail machine, offering enough ground clearance to get around most trails without getting hung up. 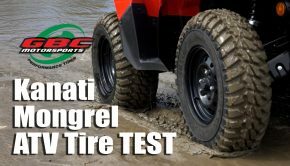 Overall, the stock tires offer decent traction and well-rounded handling in a variety of conditions, although the front tires closely spaced tread will pack up in mud. The widely spaced rear tread wears a little faster than heavier aftermarket cross-country racing tires. With most of today’s trails being cut 60” wide for the cagers, the low and wide YFZ enjoys super stable performance on off-camber trails while still enjoying plenty of room to maneuver in most sections. We might as well point out that wider is also generally better for the dunes as well. With most of today’s trails being cut 60” wide for the cagers, the low and wide YFZ enjoys super stable performance on off-camber trails while still enjoying plenty of room to maneuver in most sections. We might as well point out that wider is also generally better for the dunes as well. 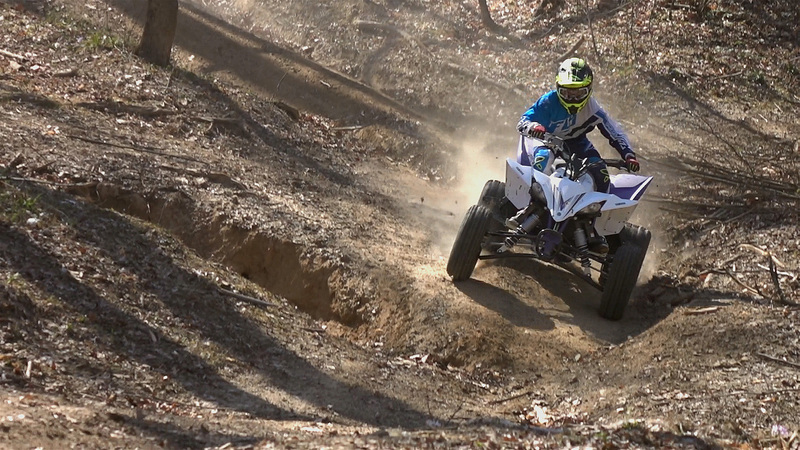 The only drawbacks we saw to the YFZ in the woods was that its broader width sometimes made it more difficult to pick the smoothest possible line compared to a narrower machine, and in stock form, it’s a bit too wide for GNCC racing. 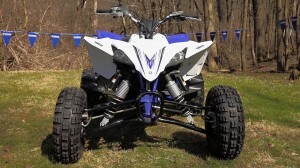 In stock form, the YFZ’s steering is relatively light and pretty accurate. High-speed stability is rock solid on flat straights or hammering through whoops. 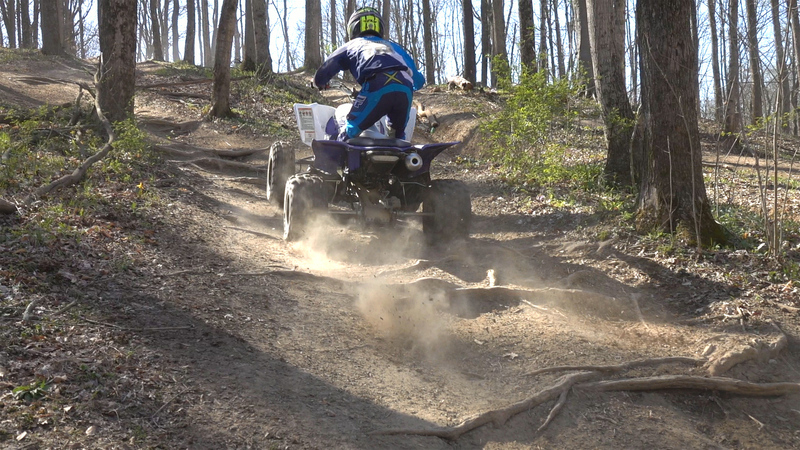 Launching off jumps, the YFZ flies straight and is well balanced in the air. In stock form, the YFZ’s steering is relatively light and pretty accurate. Some running a softer aftermarket shock setup have noticed a slight quirk in the machine’s steering. 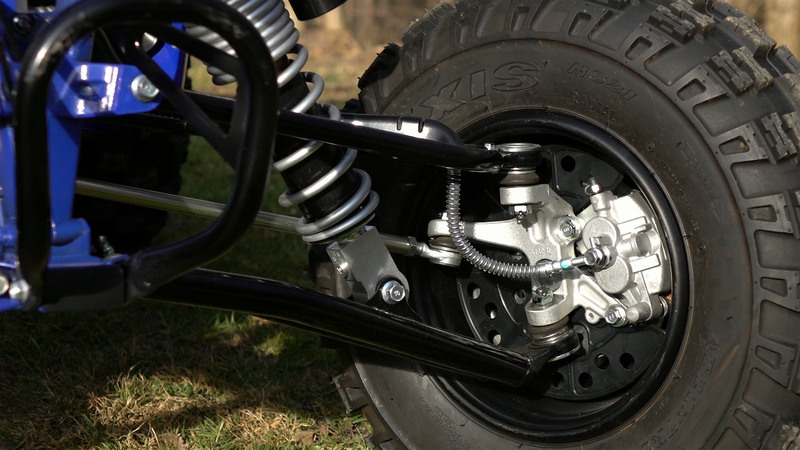 The YFZ450R’s front-end design causes the A-Arms’ caster to increase slightly as the front shocks compress. This makes the front end want to straighten out a bit as the shocks go through their stroke, having a small effect on steering feeling and accuracy in extremely rough corners. It’s not a new phenomenon and is virtually undetectable with stock shocks. If it becomes an issue for you, Teixeira Tech makes an affordable replacement upper A-Arm that’s said to cure the bug and provide caster adjustment for your YFZR’s front end. No matter where you ride, you can’t ask for much better brakes. Hydraulic disc brakes with dual piston calipers are found at both ends. A wave-style rear rotor is used for improved cooling. Braking power and feel is superb. The YFZ stops fast with light pressure needed front or rear. Its action is progressive, easy to modulate, and power is abundant. We charged our track’s downhills with confidence knowing we had the stopping power necessary to make turns at the bottom. No matter where you ride, you can’t ask for much better brakes. The YFZ450R’s lower seat and handlebar height put you in the attack position while the opened-up cockpit offers plenty of room to move around. The YFZ450R’s lower seat and handlebar height put you in the attack position while the opened-up cockpit offers plenty of room to move around. The seat is flat and firm enough, allowing for easy movement while providing decent comfort for a machine focused on racing. Massive 2.6”wide footpegs offer race ready comfort, traction, and stability. Four position adjustable handlebar clamps allow you to move the bars forward or rearward. There’s also an adjustable reach brake lever, all helping you dial in the cockpit for maximum comfort and control. Fit, finish, and quality of construction are superb as always, and the machine is littered with features to ease maintenance for competitors. Fit, finish, and quality of construction are superb as always, and the machine is littered with features to ease maintenance for competitors. Grease fittings allow for easy lubrication of the chassis’s moving parts. Quick release fasteners allow for the removal and reinstallation of the bodywork in minutes. Tool-less removal of the air filter allows for quick servicing; however, we would like the addition of a flange where the filter meets up against the side of the airbox, allowing for the use of a clamp-on style filter for added security, even if it means we have to use a flat head screwdriver to remove the filter. Yamaha offers an accessory billet flange and clamp filter setup in their GYTR catalog. We would also like to see Yamaha use the same flat finish, textured plastic they use on the side panels on the bottom of the lower rear fenders to reduce the appearance of scratches from boot wear. 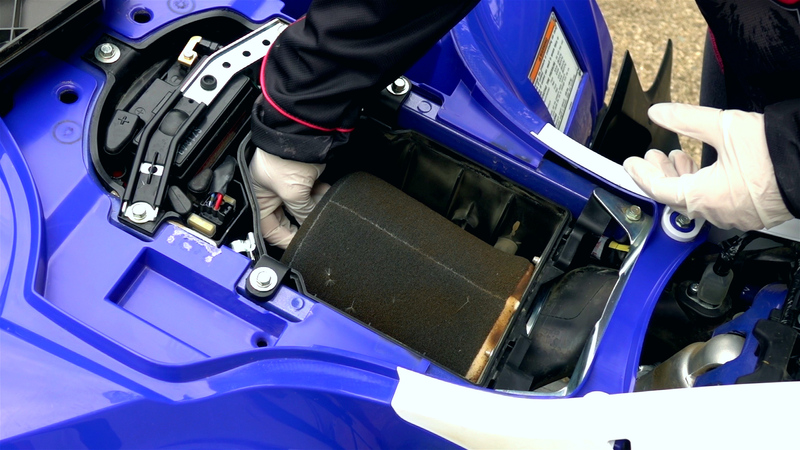 Tool-less removal of the air filter allows for quick servicing. 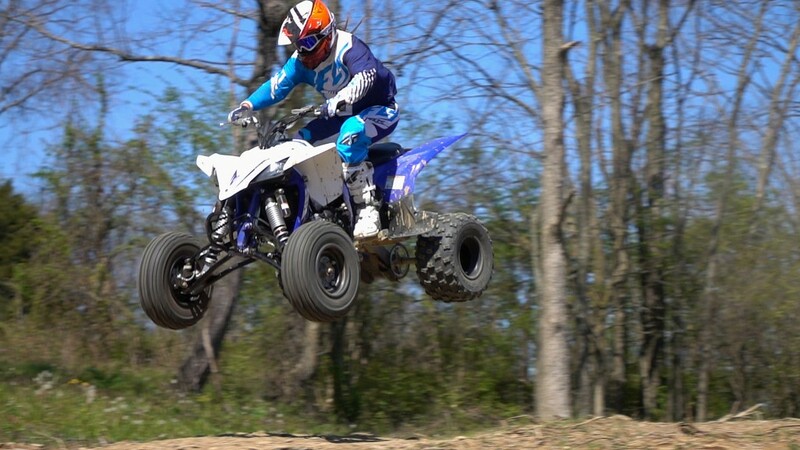 Right out of the box, the YFZ450R is sort of the ultimate play racer that can rip it up on the track or the trail. Arguably, no other stock 450 in history could do both as well. It offers tremendous versatility for building a machine that can win championships in the woods, or on the frack for local racers, and top pros alike. For around $1,000 in accessories, you can get started racing MX locally, and for a bit more, you can build a reliable, competitive cross-country racer. 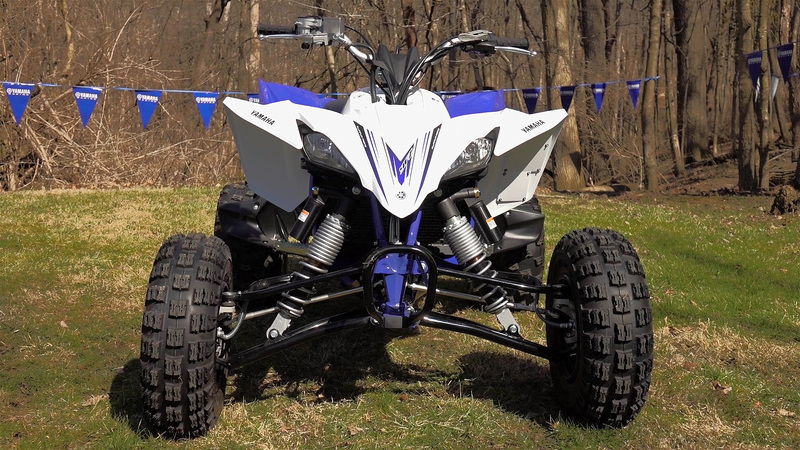 The 2016 YFZ450R is for the serious sport ATV enthusiast who wants a machine providing the shortest distance between the dealer showroom and the checkered flag, whether you’re racing the Nationals or just racing your friends. While some will balk at the machine’s $8,899 price tag, you get what you pay for. In this case, it’s a recently highly-updated, second generation machine, that’s borderline race ready, and frankly, it’s hardly more expensive than a dirt bike. 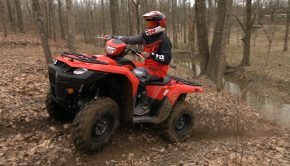 We, too, see the need for a price point focused sport ATV that adults will want to own and ride, but the YFZ450R is that machine. The 2016 YFZ450R is for the serious sport ATV enthusiast who wants a machine providing the shortest distance between the dealer showroom and the checkered flag, whether you’re racing the Nationals or just racing your friends. Summary: Right out of the box, the YFZ450R is sort of the ultimate play racer that can rip it up on the track or the trail. Arguably, no other stock 450 in history could do both as well. It offers tremendous versatility for building a machine that can win championships in the woods, or on the frack for local racers, and top pros alike. For around $1,000 in accessories, you can get started racing MX locally, and for a bit more, you can build a reliable, competitive cross-country racer. The 2016 YFZ450R is for the serious sport ATV enthusiast who wants a machine providing the shortest distance between the dealer showroom and the checkered flag, whether you’re racing the Nationals or just racing your friends.